Why should Millennials eat watercress? Dr Lucy Williamson is a nutritionist who believes in the exceptional quality of our British food produce, and through her work with schools, personal consultations, events for the public and as a visiting lecturer at the University of Hertfordshire, Lucy highlights the importance of including dairy, beef, fish, fruit, vegetables and grains in a balanced diet, following current intake recommendations. She is also currently developing the ‘food LINKS’ initiative, linking British food producers with the latest scientific research to promote the health benefits of their products. Cue Watercress! Lucy is keen to highlight the different roles that the peppery leaf plays in the healthy functioning of the body and its importance in the daily diet. Here she focuses on how important the inclusion of watercress is in the diets of Generation Z and Millennials, particularly as they adopt more and more plant based diets. Our generation of Millennials and Gen Zs (our new generation, born after 1997) are to be respected for making choices in line with their values. When it comes to food the focus is on sustainable - healthy for people and planet and inevitably more plant-based. That’s all fabulous, but with my nutrition hat on, it’s really important to spread awareness that nutrient demands are high for this savvy group of consumers, whether teenage and developing rapidly or Millennials – working hard, planning a family and possibly sports enthusiasts too. It’s important to understand where nutrient-gaps can occur in plant-based eating. Enter Watercress! Just another trendy green or a truly fabulous source of nutrients? Were you born after 1981? Check out these nutrients you need, our seasonal watercress is bursting with them, and decide if watercress should be on your shopping list! IRON demands are especially high during growth and development, pregnancy, breast feeding and of course, sport. It’s worth noting that the iron in plant-based diets is less easy for our bodies to absorb than the type found in meat, so called haem-iron. 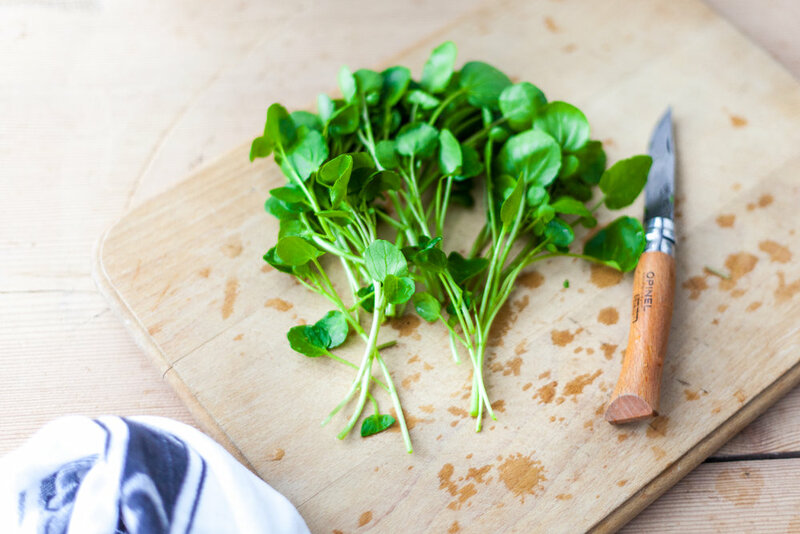 Luckily, watercress is high in VITAMIN C which promotes the absorption of its iron by converting it into the same form as haem iron. In fact, 80g of watercress contains more Vitamin C than an orange of the same weight! With 46% of 11-18 year-old girls below the recommended daily intake of iron in the UK1, this is a tick for Watercress. Low iron means we can’t use the energy from our food so well; growth and development are energy zapping processes. Furthermore, avoiding low iron stores during pregnancy is a must, being essential for brain development in unborn babies into the first year of life and also of course to prevent maternal iron-deficiency anaemia. Watercress is a rare green leaf in this respect – a leafy green with good iron availability should be top of the shopping list! CALCIUM is of course needed during growth to reach maximum bone density by age 18 – there’s no going back after this, yet nearly 25% of teenage girls have an intake below the lowest recommended daily amount*. Beyond this age group, calcium is always required to maintain bone density and provide for that of a developing baby. Calcium is absorbed better from dairy than any other food source, but dairy may not be on the list of favourite food choices (I wish it were; it really should be). 100g watercress gives a quarter of the recommended daily amount although much more is required during pregnancy and breastfeeding. VITAMIN K is also a key nutrient in bone density and Watercress is a Vitamin K powerhouse! It’s not as easily absorbed from plants as it is from food of animal origin, but 100g Watercress contains four times our recommended daily intake so it’s a pretty good source of another valuable vitamin. FIBRE is a type of carbohydrate that can’t be digested in the small intestine. Instead, it passes to the colon (large intestine) where it’s fermented by billions of gut bacteria to produce many compounds essential for our metabolism. Collectively, the genetic make-up of these bacteria is known as our ‘Microbiome’. With 150x our own genetic makeup, our microbiome is to be nurtured; in fact our ratio of human cells to bacterial cells is 1:1 so we’re just as much bacteria as we are human! ** We now know these gut bacteria have key roles in our long-term health, from optimising our immune system to protection against certain types of cancer and obesity. *** In addition, fibre maintains our ‘digestive health’, helping food to pass more quickly through the gut. In 2016, The Scientific Advisory Committee on Nutrition (SACN), who report the findings of research studies to Public Health England, advised increasing the recommended intake of fibre for children (18g/day) and adults (30g/day), as a result of firm evidence for its health benefits, collected over several years. Watercress, along with other fruit and veg (diversity is the key to good microbes!) is a great source of fibre but it also has one of the highest levels of ANTIOXIDANTS. Our gut bacteria have an important role activating these antioxidants before we can use them for essential daily detox to reduce DNA damage from the many toxins we’re constantly exposed to – either in the environment or those from metabolic processes within our body. FOLATE is in all fibre-containing foods like Watercress and is needed in far higher amounts before and during pregnancy to avoid neural tube birth defects such as Spina Bifida. SUSTAINABLE food choices are to be encouraged - Food production accounts for a quarter of all greenhouse gas emissions; increasing plant-based foods in our diet is a good step towards a healthier planet (but I always stress beef and dairy can and should be sustainable options too – especially if pasture fed; they’re a valuable source of easily absorbable nutrients). The Watercress Company (https://www.thewatercresscompany.com/) (TWC) protect biodiversity and ecosystems by carrying out an annual conservation value test on their water outflow, they are economically fair and affordable, and their production methods are safe and healthy while optimising natural resources. They also use biodegradable chilled packaging and when watercress is out of season in the UK over the winter, they transport it from their British farm in Florida using only spare space on Virgin Atlantic Flights! They also develop COMMUNITY based projects, currently supplying free surplus watercress to a community kitchen which is part of the @endhungerUK campaign and collaborating with their local Dorset county hospital Cancer Care unit. SPORTS PERFORMANCE demands nourishing recovery drinks and in today’s climate of ‘keeping sport clean’, natural nutrients are surely to be encouraged – Vitamin C and antioxidants are valuable in reducing oxidative stress which occurs during intense sport and can lead to DNA damage and prolonged return to training. Oxidative stress can also weaken the immune system, so a great source of Vitamin C, like watercress, can be a valuable ingredient in any sports recovery drink. Moreover, watercress is a low sugar, low salt food with its high protein content accounting for half its calories! So, calling all Teens and Millennials! * NDNS: National Diet and Nutrition Survey, UK. Continuous survey carried out by Public Health England and the Food Standards Agency to assess the health of the nation. Data taken from latest update, 2018.